WT Farley Inc. introduces a new series - IVDeluxe and Versa IV Poles and accessories with features designed specifically for the hospital environment. Configure your IV pole to meet your needs by mixing and matching with our various accessory options. Most of our accessories work with competitive products including Stryker, Pryor, and Hill-Rom. 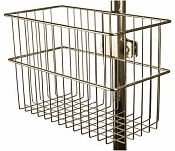 These include our intravenous pole-mount cylinder holders, dual cylinder holder, equipment tray, and baskets to safely store medical equipment. What makes our IV poles stand out? Our line features a heavy duty, rolling base with low center of gravity for stability on our stainless steel and equipment stand models. Another key feature is our slow descending telescoping pole. To help identify items by department, we offer four color options for all of our products. Standard features on our high quality, very stable Dual IV poles include: a 6-leg heavyweight base (20 lbs. ), low center of gravity, epoxy powder coated, and 3-inch premium casters (two with brakes) with a 10-year warranty on the casters. Our Single IV poles are also high quality, very stable products. They include all the same standard features as the Dual IV poles and come with a 5-leg heavyweight base (17 lbs.). Custom configurations are available. We also offer a complete line of equipment stands and poles.